Ron Coluzzi could make a legitimate case for Iowa’s team MVP through four games. The graduate-transfer punter from Central Michigan has been terrific for the Hawkeyes, and on Monday he was named the Big Ten Conference’s special-teams player of the week for his latest efforts. 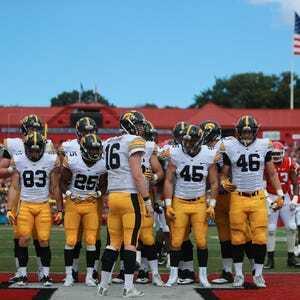 Coluzzi punted seven times for an average of 42 yards in Iowa’s 14-7 win against Rutgers. Every last yard was net — there are still zero return yards this season on Coluzzi’s 20 punts. Coluzzi pinned Rutgers inside its own 20 four times on Saturday and didn't give electric return man Janarion Grant a chance to beat Iowa. He's induced a fair catch 75 percent of the time this season (15 punts), and only one punt has gone for a touchback. In 2015 (without Coluzzi), the Hawkeyes ranked 96th in FBS in net punting at 35.85 yards per kick. This year, they rank 12th at 42.24. That’s good for second in the Big Ten, behind Ohio State’s 47.18. The Buckeyes’ Cam Johnston leads the league with a whopping 50.6 yards per attempt. Iowa hasn’t had a first-team all-Big Ten punter since Nick Gallery in 1996. Ryan Donahue was the last second-teamer, in 2008 and 2009. There were no alarm bells on Iowa’s depth chart going into Saturday’s home game against 1-3 Northwestern (11 a.m., ESPNU), a sign that the team came out of Piscataway, N.J., with no serious injuries. Linebacker Josey Jewell was hobbling toward the end of the game, appearing to get injured during Rutgers’ final drive. But he played all 77 defensive snaps Saturday. Defensive tackle Nathan Bazata left Saturday’s game for a while with a quad injury, but he returned. The Hawkeyes (3-1) have played sluggishly in both 11 a.m. games this year, but they’ll need to shake that. The next three games are also at 11, with the Oct. 8 date at Minnesota announced Monday as a morning kick with television coverage on either ABC or ESPN2. Iowa’s Oct. 15 game at Purdue is also at 11 a.m., giving the Hawkeyes five straight contests at that time.